That mushy, bland stuff at the grocery store is awful. 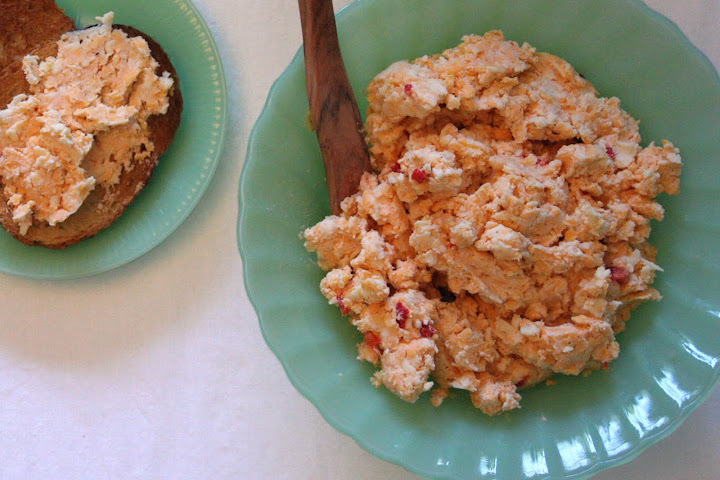 But real pimento cheese is a treat, and it's easy and popular fare for parties. All the amounts are approximate, and I've toned down the garlic and spice to make it palatable for normal people. If you really like onion, you can grate a couple of tablespoons and add it in lieu of the onion powder. Heating the garlic mellows and rounds the flavor a bit, but it's not crucial by any means. There's a fancy way to do this, and a simpler way. Peel the paper off the garlic, and microwave it in a small bowl for 30 seconds, shaking or stirring the cloves every 10 or 15 seconds. In a food processor, combine heated garlic, cream cheese, sour cream, salt, spices, Worcestershire sauce, and pickle juice until completely smooth. Scrape mixture into a large bowl, and stir in grated cheese and pimentos. Adjust spices and sauces to taste. Mince garlic. In a large bowl, stir together cream cheese, sour cream, garlic, salt, spices, Worcestershire sauce, and pickle juice until smooth. Stir in grated cheese and pimentos. Adjust spices and sauces to taste. Serve on sandwiches, crackers, hamburgers, et cetera. I put this out at Allen's last birthday party so people could put it on their burgers, but it was eaten before the burgers were done cooking. It looks like a ton of cheese (and it is), but it probably serves about eight to ten people.